Evertec (NYSE: EVTC) – Evertec is based in San Juan, Puerto Rico and is engaged in transaction processing for financial institutions, merchants, and corporations in Latin America and the Caribbean. The company’s electronic payment systems network processes approximately two billion transactions. The company was formerly known at Carib Latam Holdings and was founded in 1988. Evertec is a little mixed in terms of its earnings results. Over the past three years the company has seen earnings decline by 1% per year, but in the most recent quarterly report earnings jumped 92% on a year over year basis. The company’s sales have grown at an average rate of 6% annually over the last three years and they jumped by 19% in the most recent quarter. Analysts expect sales to jump another 6% in the next quarter. Two of the most impressive fundamental stats for Evertec are its return on equity and its profit margin. The ROE is currently at 77.2% and the profit margin is at 30.2%. The company also boasts an operating margin of 27.6%. 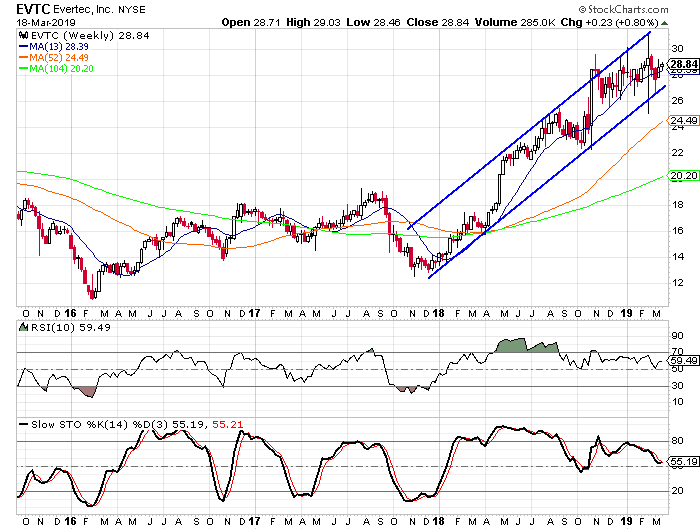 The sentiment toward Evertec is somewhat mixed with analysts bearish and short sellers bullish on the stock. The short interest ratio is low at 1.16, but there are only seven analysts following the stock. Five of those analysts rate the stock as a “hold” while the other two rate it as a “buy”. This is pretty low coverage for the stock and it leaves room for additional coverage and upgrades. Looking at the weekly chart we see the steep climb Evertec has experienced over the past year. The stock doubled in price in 2018 and it didn’t drop in the fourth quarter when the overall market was going through its sharp selloff. There is a trend channel that has defined the cycles within the overall uptrend and the stock just hit the lower rail two weeks ago. Suggested strategy: Buy EVTC with a maximum entry price of $30.00. I would set a target of at least $45 over the next 6 to 9 months (for a potential return of over 50% from here). I would also suggest a stop at $26.00.